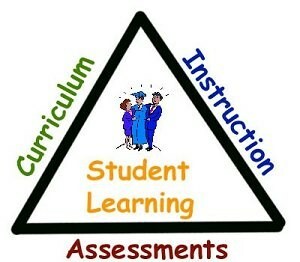 Welcome to the curriculum and assessment webpage. We are pleased that you have chosen to visit our site and learn more about the curriculum and assessments which are used in all of our classrooms across our district. Curriculum is defined as, “The courses offered by an educational institution.” This definition certainly appears to be broad, but fits the scope of our work very well. Over this next school year you will notice some changes to instruction and testing in our schools that will directly impact your child. It is essential that you know about these changes and what resources are available to help you support your child. On April 27, 2012, the Wyoming State Board of Education adopted the Common Core State Standards (CCSS). Wyoming is one of forty six states and U.S territories that have adopted the CCSS. The standards were developed out of a partnership between the Council of Chief State School Officers and the National Governors Association and are not an initiative of the federal government. These newly adopted standards provide a consistent, clear understanding of what students are expected to learn in grades, K-12, in math and language arts. While there are many similarities between the existing Wyoming state standards and the CCSS, you might notice changes in what content is emphasized and the grade in which the content is taught. For example, there is an increase of reading of informational text at all grade levels. In addition, writing instruction emphasizes the use of evidence to inform or make an argument. Teachers will also need to create more time for close and careful reading and provide appropriate and necessary supports to make the central text accessible to all students. The Common Core State Standards for mathematics stress both conceptual understanding and procedural skills to ensure students learn and can apply the critical information needed to succeed at each level. The Common Core Math Standards require students to demonstrate an understanding of the content standards through the use of the Common Core Mathematical Practices. The purpose of adopting the CCSS is not simply to align with other states, but rather to raise the bar in all grades to ensure that our students are receiving a relevant and rigorous education. The adoption of the CCSS means that your child will be better prepared to meet the demands of college and/or the work place in the 21st century. Today's global economy means that our students need to possess academic standards by the completion of twelfth grade to ensure their success in college and/or workforce. For additional information please click here . In addition, the National PTA has organized resources to help parents support their child. This information can be found by clicking here . Finally, we would like to encourage you to take a look at the Assessment Calendar link. This calendar gives the name of the assessment which will be given to your child and the date of administration. You may find this helpful when planning vacations or other days when your child may not be in school. Our district requires that students participate in the administration of several assessments to gather data to assist teachers when planning instruction for your child. Those assessments include WYTOPP for students in grades 1-10, ACT for grade 11, and, and ACCESS for all of our ELL students. All of this assessment information is available to parents through the parent portal of Infinite Campus, our student management system. In closing, we would like to thank you for visiting the curriculum website and if you have any questions or concerns about our district's curriculum or assessment information please feel free to call and we would be happy to visit with you.